Neoantigen identification, or the detection of tumor-­specific variants, is a critical step in personalized cancer vaccine development. Due to the robust clinical standards required for producing cancer vaccines, there is a strong demand for well validated neoantigen detection platforms. 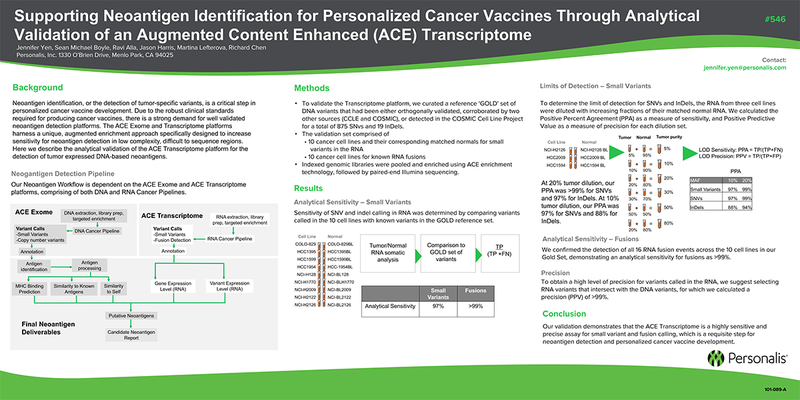 The ACE Exome and Transcriptome platforms harness a unique, augmented enrichment approach specifically designed to increase sensitivity for neoantigen detection in low complexity, difficult to sequence regions. Here we describe the analytical validation of the ACE Transcriptome platform for the detection of tumor expressed DNA-­based neoantigens.